Gone are the days of presenting a printed copy of your resume to potential employers, hoping that this one piece of paper will be your golden ticket to the factory known as ‘my dream job.’ Alone, your resume won’t do your skills and experiences justice in today’s competitive job market – you need to do something more to set your talents and noteworthy projects apart from the crowd, like creating a resume website. So you might’ve already bought a new suit and polished your loafers to the point that you can see your reflection in them, but you still aren’t quite ready to apply for the job. As an engineer or any business professional, an impressive resume website template like this one is the missing key to landing a position in an established company or high-tech startup. The one-page design is all you need to get your name out there. From the moment you enter, the dominant visual is the slideshow that displays everything from an ‘About’ section to experience, education, hobbies, and interests. Then, no matter where you scroll on the website, the CTA button is pinned to the screen so that no one will ever miss the opportunity to download your resume should they need it in hard copy. Lastly, the bottom of the template is finished with a simple contact form to make sure that future employers are able to easily reach you. Fields: Any business professionals, including information technology specialists and engineers. As someone graduating from university soon and entering their field of profession, there might be an expectation to prove yourself more than anyone else. It’s like constantly standing on your tiptoes next to your freakishly tall friends. Use this template and you’ll find yourself standing tall amongst the crowd. The ‘Skills and Languages’ section is a prominent element as the bar graph style feature helps you rank and display your strengths, while the animated lines are sure to catch anyone’s attention. The other feature that really stands out is the strong footer which includes everything from an email to a CTA button to download your CV, a social bar, a short quote, and a ’back to top’ button. And if you’re looking to add some pizzazz, this is one resume website template that understands how to execute the right mix of multiple fonts appropriately. Fields: College and university students. Writer’s of the world, this one goes out to you – well, you, and everyone else that has some awesome projects that they want to display. This template is a favorite for those occasions when your work is worthy of a showcase of its own. That’s why one section of this website is specifically dedicated to your pieces. For writers, you can benefit from the already embedded blogging feature. Wix Blog combined with a member’s area allows this template to serve yet another function as a hub for a strong community to like, comment, and share your posts. The other page of the website includes everything a complete resume should entail: a summary, skills, experiences and contact information. This is broken up with a vertical anchored menu, pinned to the right side with side menu buttons to help users navigate the long-scrolling page. On top of these grand elements, you’ll find a pop of calming pastel peach color throughout the template accompanied by just enough white space to manifest a balanced design. Fields: Journalists, content writers or any other marketing related jobs. In a performance-based industry, you need a website that can also act the part and display your work beautifully online. This website template is overflowing with the right mix of visual components to land you your next casting role. If you have lots of content to display, the multi-page format here is excellent for letting each component breathe. Starting with your videos, there is one page dedicated to just this – and by utilizing the Wix Video feature, you can showcase your work by uploading it directly or easily syncing it from another platform (YouTube, Facebook, or Vimeo). 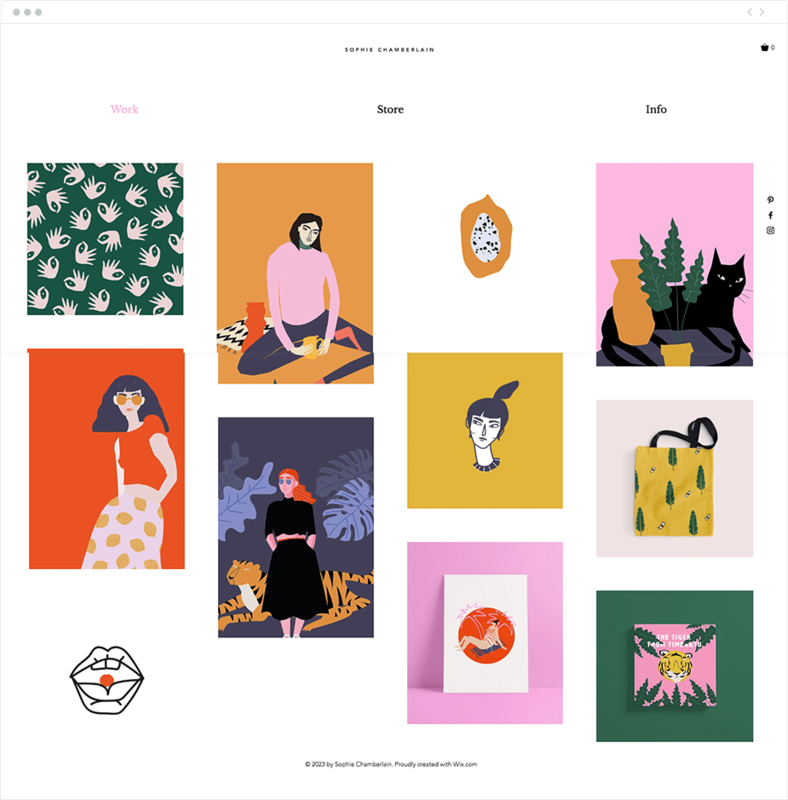 A clever way to highlight this section stems from the Home page CTA: ‘Watch Reel.’ For stand out images that are displayed beautifully, this template also embeds the Wix Pro Gallery. When you click on an image, you’re taken to a page of its own, with room for a title, description, and an option to like it. On top of displaying your work effectively, there are many other subtle features that we love about this template, like the smooth page transitions from one menu item to another, the stellar use of white space, and pop of red throughout. Fields: Actors, models, creatives (film, photography, design, etc.). Whether you run a small business of your own or you’re looking to work for the big guys, you need a resume website that’s just as serious as you are about your goals. Starting with a business-card type layout placed ‘above the fold’ (the area before you scroll down), every crucial piece of information is available – a headshot, professional career title, contact information, and a social bar. This is also one of our favorite one-page website designs too, as it breaks up every section into its own polished component. When it comes to honing in on your experiences and abilities, this template will do each of them justice – from the timeline design and highlighted skills to the dedicated paragraphs for each area of expertise. You’ll also notice the engaging design created through subtle animation effects that make each element come alive as you scroll down, starting with the headshot, and moving to resume items, skills, and more. Fields: Lawyers, consultants, accountants, financial service providers or any other professional freelance jobs. No one appreciates the importance of visuals more than a designer. Maybe Picasso, but he wasn’t around during the era of web design. In today’s technology-driven world, you need a resume website that can sell your visual content for you, like this template. Functioning as a designer’s portfolio, while doubling as a polished resume, the strong design of this layout is bound to impress future clients. The clean grid structure gracefully displays each image or animation as if they’re inside a virtual art gallery. Apart from looks, this resume website template is your one-stop shop for everything you need as a designer, from the built-in Wix Stores feature that allows you to sell your products online, to the email subscription form. If you’re known for your creative mind, utilize these internal features as building blocks to allow your personal brand to flourish. Fields: Graphic designer, illustrator, photographer or any other creative field. As someone looking to find a job, you want to impress your potential employer with the best resume website. This template is not only fully operative for just about any profession, but you can make your resume shine with the fun and vibrant colors that are pre-selected for you. More bold features included are the name, header, and professional headshot. Speaking of attractive elements, the noticeable CTA buttons cleverly function as menu items that link to other pages of the website (resume, work, and skills). Design-wise, the circle-shapes throughout the layout create consistency among the buttons, footer, and photos. So, if you’re simply looking for a starting point, this template can fulfill all your professional needs. Fields: Any industry (i.e., real estate agent, freelancer, contractor, tutor). Ready to display your expertise online and land the job you’ve always dreamed of? Create a resume website with Wix today!